Dimapur, March 26: The deputy commissioner (DC) of Dimapur, Kevekha Kevin Zehol lamented that most people today are dependent on products, including rice, that come from outside the state instead of cultivating food on their own like in the past. 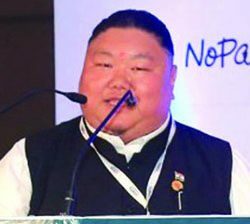 The DC was speaking during the inaugural function of the 10-day zonal-level Prime Minister’s Employment Generation Programme (PMEGP) exhibition organised by the Nagaland Khadi and Village Industries Board (NKVIB) at Super Market, Dimapur on March 26. Citing how the jhum cycle has been drastically shortened of late, Zehol said villages in the state are becoming “static” with people moving out as human population increases. Zehol also urged the people availing the scheme to pay back their loans on time. “Many banks are hesitant to give loans due to poor recovery,” he maintained. The PMEGP is implemented by the Khadi and Village Industries Commission (KVIC) functioning as the nodal agency at the national level. At the state level, the scheme is implemented through State KVIC Directorates, State Khadi and Village Industries Boards (KVIBs), District Industries Centres (DICs) and banks. While most people aspire to accomplish their goals when young and rest when they grow old, Ikato, an 80-year-old man from Suhuruto village in Zunheboto district defies this ‘normal’ trend. Eastern Mirror caught up with the elderly man at the inaugural function of the zonal-level PMEGP exhibition at Supermarket, Dimapur. Ikato has been carving wood for the last 20 years in his village and has been selling them at reasonable prices to those who come to buy. He beamed with pride as he showed his carving tools and wood products he had set up at a stall. Making wood products such as meat cutters, trays, machetes and many others, Ikato said that his business is neither good nor bad. “I have my regular customers that come to me for different kind of woodwork but it’s a small village so not many customers are there,” said Ikato. When asked how he found out about the PMEGP scheme and the exhibition, Ikato replied that one of the organisers known to him had asked him to take part. Clearly, the oldest participant at the exhibition, Ikato also shared that he uses wood grown in his own land in the village. He chops them himself. When asked if this profession is what supports his family and household, Ikato said that all his children were adults with their own families and that his wife passed away few years ago. He said it was more about what he enjoys doing at his age and also earning some money while at it. 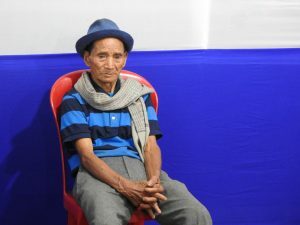 “My son accompanied me to Dimapur from Suruhuto for this exhibition; I hope people will appreciate my work without looking at my age,” quipped Ikato.